Saleem Ch: Teach your children three things; Love of your Prophet; Love of his Ahl al-Bait and the recitation of the Quran. Ashraf Tharuvara: Even those here who may have heard of Rashid Rida may not be aware of such an aspect in his contribution to Islam. Most would remember his name for the ‘political’ thoughts he held. Ashraf Tharuvara: The single biggest worry about many traditional moulids out there would indeed be what was said in this article too: “…..despite being aware of the ‘non-canonical’ nature of the narration, authenticated it because its lack of authenticity does not do any harm on the believer. It rather links his belief with the beliefs of communities before the arrival of Islam. . .” It is obvious to the wise that such ‘connections’ may eventually end up in some very wrong connections – just as medieval Islam got connected to the Byzantine fairy tales. Ashraf Tharuvara: Having said that, excess doses of ‘Wahhabism’ have indeed ended in the community having no clue of what their beloved leader was. Everything seems to be just an ordinary man and more ordinary people around him, and truck loads of orders and prohibitions. Anonymous: The Mujahids of Kerala were actually the followers of Rashid Rida. But now the official group has moved towards Salafism of Arabia. Ashraf Tharuvara: That comes as a bit of a surprise, @Anonymous. If it is the Kerala Nadvathul Mujahideen (KNM) you are referring to, it would be very unlikely. And if it is the precursor of KNM, called ‘Aikya Sangham’ that you refer to, well, I don’t know about that. But if that is so then how come they never subscribed to the political views of Rashid Rida? Anonymous: See this link: The Mujahids are, as we mentioned earlier, the Kerala counterpart of the Ahl-i Hadith in north India, but are rather more moderate, sharing an understanding of Islam somewhere in-between the so-called ‘Wahhabis’ of Saudi Arabia and the nineteenth century modernizing Salafis of Egypt, such as Muhammad ‘Abduh and Rashid Rida. Anonymous: Rasheed rida was against blind Taqlid and he didn’t endorse – Hasan al-Banna-esque revolution. These main ideological points were (and still are, I guess) followed by Mujahids. Ashraf Tharuvara: I had like to hear more on that, @Anonymous. And as to your take that the ‘Salafis’ of Kerala were inspired by Rashid Rida is still something not known to many, like me. Mohammed Iqbal: Kerala Mujahids were inspired by Sheikh Muhammad ‘Abduh and his disciple Rashid Ridha, make no mistake about it. KNM journal started in 1951 was called Al-Manar which was named after the journal started by Sheikh Muhammad ‘Abduh. Ashraf Tharuvara: So what made them remain aloof on Islamic views on matters of politics, Mohammed Iqbal? Was it a decision of prudence or one of convenience? Mohammed Iqbal: Well, as far as I know, most Islamic groups in Kerala don’t have any political agenda of their own, except one group i.e., JIH and their spin – offs. I’ll name all other groups. Sunni – two factions, Mujahids – multiple factions, Tablighi Jamaath, Chekannooris so on and so forth. None of these groups are into politics, nor do they consider it is part and parcel of religion to do so. Why then you pick on Mujahids alone for this ‘allegation’? Ashraf Tharuvara: The reason is that it is near impossible to isolate Rashid Rida and politics, Mohammed Iqbal. How can we when he is a prominent figure in the shaping of the ‘Salafi’ version of Islamic politics? 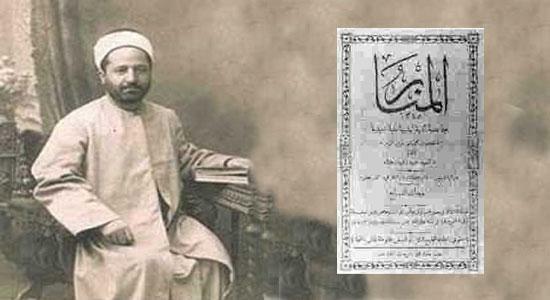 Syed Rashid Rida (CE 1865-1935) as the reformers who paved the path for the Salafi movement in Muslim countries. Ashraf Tharuvara: So the question remains, Saleem Ch, as to how and why KNM ended up subscribing to only the ‘worship’ part of Rashid Rida’s ideology and not the political aspects of it? Not even the compartmentalized yet inclusive approach of Muhammad ibn Abd al-Wahhab, for that matter? Anonymous: May be exactly for the reasons that they didn’t believe in blind Taqlid. Don’t u think, they rightly didn’t subscribe to politics? Saleem Ch: Any effort to separate life into different compartments is bound to create difference of opinion, as there are inseparable overlaps in different aspects of life. Even staying away from politics can be a political decision. I hope sooner or later the Ummah will come to see what has been said there, Saleem Ch. Anonymous: Going ‘apolitical’ is one political decision I am happy with. Fortunately someone back there realised that politics can turn bloody too. Mohammed Iqbal: Dr. Ashraf Tharuvara Sahib, KNM people say they take inspiration from the teachings of Muhammad ‘Abduh and Rashid Rida. But you object that they cannot claim the legacy of Rashid Rida, because they don’t follow the latter’s political ideology. Rashid Rida was a disciple of Muhammad ‘Abduh and yet there is a vast divergence in their views. Muhammad ‘Abduh is close to the “Modernist’ school of thought, Rashid Rida was more traditionalist, yet they were inseparable. No one seems to have objected to this association. Ashraf Tharuvara: I agree with most of what you said above, Mohammed Iqbal. But looking at it from a middle-eastern perspective, we don’t see many ‘Salafi’ movements in the past few decades that can claim true neutrality in politics. Rather what they have done in many cases is a simple division of labour: one core team to attend to just the aspects of morality, monotheism and ‘Hudood’ etc., while another one to ensure continued and continuous support from the ruling machinery to the first team. Kingdom of Saudi Arabia may be the best example in this regard. Ashraf Tharuvara: The system to an outsider can appear as a separation, but in reality it is not at all so. There are clear understandings on who can do what, and very rarely would any party venture to cross lines. This ‘self awarded and proclaimed separation of religion and politics’ is not unique to KNM. The majority traditionalist Sunnis of Malabar are divided into two groups denoted by two English alphabets each. The numerically superior E K faction is entirely aligned with the Muslim League, while the more resourceful and influential A P faction is aligned with CPI (M). Do you think this is due to their differences in the interpretation of the political nature of Islam? No, not at all, it is political expediency, pure and simple. Again, an influential Muslim group ‘Tablighi Jamaat’ too don’t have any political stands anywhere in India. All these groups don’t ask their followers to vote for this party here or that party there. In fact other than JIH and their off shoots, no Muslim groups have any doctrine that combines politics of the land and Deen ul Islam. So, I feel your singling out KNM for criticism on this matter is not justified. Please don’t get the impression that, I am a supporter of KNM in all matters. The reason why I have come to their aid is they seem to be orphaned in this forum with no spokesmen to argue on their behalf. When the time comes, when they get enough members into this group to speak up for them, I assure you I will stop holding brief for them. Ashraf Tharuvara: My take on KNM vis-à-vis their perceived or proclaimed political neutrality is not specific to them. It would apply to anyone with a similar stance. And I am not suggesting that such is wrong. Rather I am trying to analyze better what happens to such a stance, in a large democracy.